At a lavish ceremony in London, women seemed to have had a strong hand (nothing to do with blackjack), scooping a total of 9 of the 16 awards up for grabs. Cal the Midwife’s Heidi Thomas and Killing Eve’s Phoebe Waller-Bridge were two of the writers honoured, with accolades across theatre, video games, books, comedy, TV and radio categories. 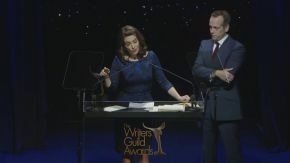 The ceremony was more star-studded than usual, because not only were the Writers’ Guild honouring the cream of British writing talent, but they were also celebrating their diamond anniversary – which meant 60 years of wins for writers!